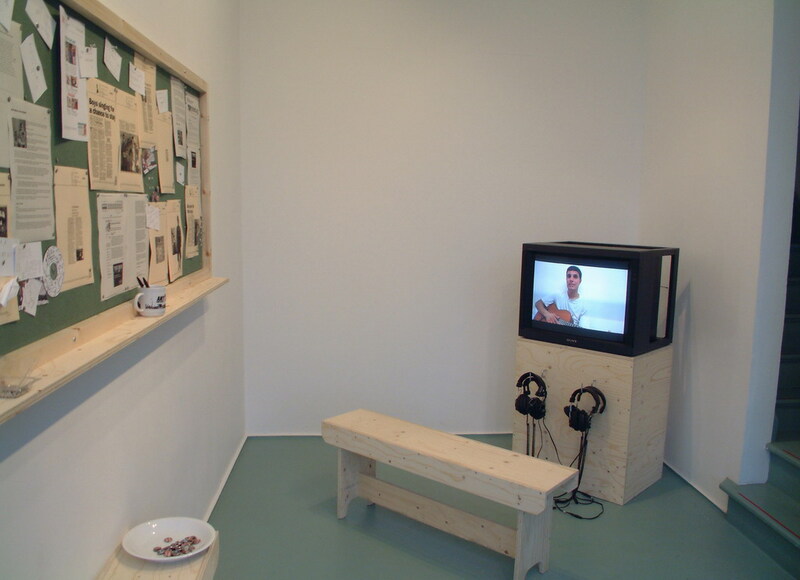 Chris Brown is an artist, musician and co-director of the artist-led gallery g39 in Cardiff. He is responsible for g39's strategic development within Wales, the UK and beyond. He is also Magazine Coordinator for a-n magazine. David Trigg: Could you start by telling me a bit about how g39 got started? Chris Brown: Well, in the year following my graduation from the Fine Art course at Canterbury Art College I moved up to Cardiff because I was intending to continue studying in South Wales. At the same time Anthony Shapland (co-director of g39) relocated back to Cardiff after graduating from the Fine Art course in Southampton. We met at Ffotogallery, where Anthony was artist in residence. He was undertaking this really amazing pinhole photography workshop with a secondary school, which I was brought in to volunteer on. At that time he was investigating the possibility of setting up an art space and had managed to get hold of a city centre building from a friend who was a shop manager. Anthony had managed to negotiate using two rooms above the shop as accommodation and then as a makeshift studio. 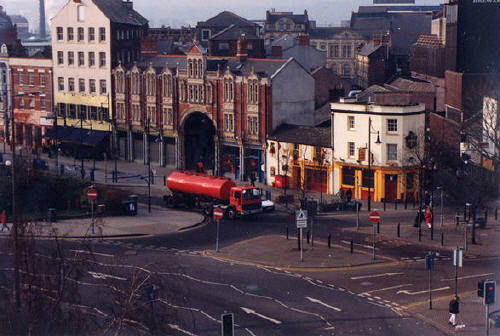 Because of its city centre location he recognised that there was the possibility of using it as a public space for exhibiting work. There was nothing like that going in Cardiff at the time, whereas straight after graduating Anthony been working in London, seeing how artist's networks operate there and how the artist-led DIY ethic was really picking up some momentum. So he brought that idea back to Cardiff and looked at the possibility of finding a platform for the contemporary work that was being produced here. DT: You mentioned that he'd had some experience of artist-led initiatives in London, was there any particular model that had inspired him to start g39? CB: Yes, Milch was one. He also did a project at the Tannery, which was quite fortuitous because that was where he met Stephen Hepworth who was their curator at the time and has since been an advisor to g39; he really helped set the bar and encouraged us to be that bit more ambitious. DT: Was the artist-led gallery City Racing an influence? CB: Yes, although I think City Racing was very particular to that era. I don't think you can take that model and place it in the late '90s or the early 21st century and have it work in quite the same way. We just took bits and pieces from several different artist-led projects and created something very peculiar to Wales. DT: How long was it from Anthony's initial concept of the gallery to getting the first show actually hung? CB: Six months. An application went to the Arts Council in December '97 and in March '98 we were granted an award. Then the renovation work on the building started and we opened the doors on July third 1998. DT: Why call it g39? CB: Well, the 'g' stands for 'gallery' and 39 is the number of the building. The thinking behind that numbering system comes from the fact that we initially thought that the building we're still in now was going to be a short-term thing and that the project would be quite nomadic, moving around to various locations. The idea was that each building we'd go to would rename the project, so we had exhibitions in g02 for example. But that system came to an end because all the other spaces that we've used since then, such as billboards or LED signs, don't actually have addresses! DT: What was your initial aim for the gallery when it opened? CB: Our mission statement sums it up: to raise awareness and understanding of contemporary work based in Wales. It was a very pragmatic thing. We set out to create this platform to exhibit all of the interesting work getting produced by our peer group. There wasn't the intention for g39 to have any kind of longevity or to have any national standing or anything. Given the context now, we almost certainly wouldn't do the same thing again, it would be very different. DT: In what way would it be different? CB: Well, the cultural landscape is now a lot healthier. When we started out, and for a good part of the last decade, we've pretty much had the sole responsibility for a large chunk of Wales' contemporary art output. It's a big responsibility and wasn't something that we particularly wanted to do and certainly wouldn't do again now, but it was just purely down to the fact that there was so little else happening. If you look at other comparable cities or regions you just don't get a fairly small, modest artist-run gallery having a national remit or having the responsibility of showing artists who live 150 miles away; that's more appropriate for larger arts centres, like Chapter. DT: So why do you think there has been such a lack in Wales over the last decade? CB: Well, there's a whole load of reasons really. One thing that I'm always quite careful not to do is to claim that everything was suddenly better once g39 came along because before us there were a whole host of really interesting artist-initiated projects, such as Cardiff Artist's Project, The Pioneers and the Old Library Artists. So there was plenty of things happening but there wasn't a permanent, independent space that offered an exhibition programme. All the artist-led stuff was very much one-off projects and public realm commissions. If you were graduating into that climate you had very little chance of getting your work shown in the existing mechanisms, you'd probably just add yourself on to the end of a long waiting list to get your work seen by the curator at Chapter. DT: Or not stay in Wales and move to London or somewhere else. 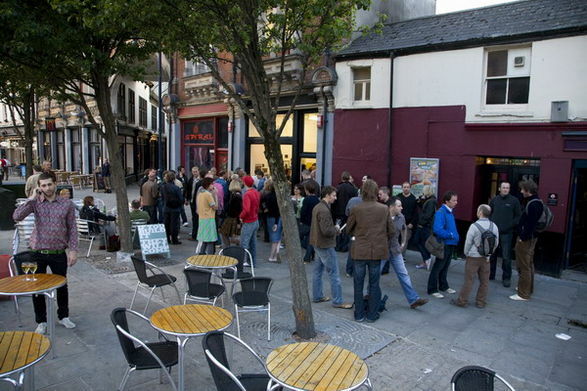 CB: Yes, so that's the change we've seen over this past decade; Cardiff is now much better at retaining its art graduates, which is such an encouraging thing to see, although it's just the start of a very long process towards getting a healthy art scene. DT: So how did you initially go about finding artists? CB: At the time, because we were both quite new to Cardiff, we didn't have a network, so the first exhibition was selected from people who we'd studied with back in Canterbury and Southampton and people who we'd met along the way during our brief three months in the local art scene. We would get recommended to people and we visited the local degree shows. That's pretty much how the first year was programmed. We did put a call out for submissions periodically but they were more successful for specific off-site projects rather than gallery based exhibitions. Now we've really honed it down to a specific way of working where we initiate face to face dialogues with artists who want to submit work, which then forms the basis of whatever relationship we have with them, whether they're moving towards an exhibition here or whether it's us facilitating a project they might be doing. We find that a lot more productive than calls for submissions. DT: You mentioned earlier that when you started out you didn't really think the project would be around for that long, so I guess you didn't expect to still be here eleven years later? CB: No, not at all! That's just not how you operate as an artist. I really shudder at the idea of a five year business plan or the question of 'where will you be in five years time?' It's just ludicrous. I mean, you can have aspirations but when you graduate from art college the whole idea of where you're going to be in five or ten years time is less of a priority as you generally end up taking very roundabout routes. Talking personally, from my own experience, having a much broader outlook on my career has meant that I've taken on board stuff that I would never have expected to, like a parallel career in journalism. I wouldn't have that if I'd had this five year career plan, I wouldn't have gone there. DT: So to what do you attribute g39's longevity? CB: Hard slog and sheer dogged determinedness, as well as a lot of support from the local art community. The Arts Council are much more clued up now on artist-led activity than when we first started, largely on the grounds of the information that we've been feeding them and our performance over the years. It's really encouraging to see that artist-led activity can now be recognised on a scale where it's a strategic part of their overall outlook. The next really big challenge is going to be with the City Council. We want to try and encourage them to understand how core artist-led activity and artist's practice is to a city's ecology. And as part of that there's also the process of educating the general public about contemporary art. It's amazing how often, almost daily, people will visit the gallery and say: 'oh is this a new gallery? how long has it been here? ', and you tell them we've been here for eleven years and they'll be amazed that they've not seen it before. By and large they'll go away encouraged by it, excited about having this new non-shopping experience in Cardiff city centre. DT. What has been the most memorable g39 event that you've worked on? CB: Without doubt it has to be On Leaving and Arriving (picture bottom of page). 2005 was the Cardiff centenary year and the city council were really plugging cultural activity, getting all manner of stuff happening. We proposed this project where the city centre would be filled with shipping containers that artists would use as exhibition spaces; a kind of art trail showing works by artists who had been shipped in from various locations around the world. It was very ambitious. We approached artists with amazing calibres like Stephen Brandes and Marcos Chaves, which was really amazing. It was also great, for the first time ever, to have that kind of dialogue with the city council and that level of support. It was a very close relationship too because we had to negotiate with them the sites for all the containers and had to work out all the logistics, like how to get power to them. It really took us out of our comfort zone but we pulled it off. The containers were far more public than the gallery could ever be because they were right in front of people when they were doing their shopping, where they hadn't been the day before ‒ you couldn't help but come across them. The show got an unprecedented amount of visitors to it and we had some fantastic responses, which ranged from people saying things like: 'this is fantastic, I can step out of my office for lunch and there's international contemporary art on my doorstep, we want more please', which was just superb, all the way through to people being so hostile you wouldn't believe. Without a doubt that show was by far the most ambitious. I certainly couldn't do it again though, it really killed us, but it was so exciting. DT: So over that time, as g39 has developed, how have you seen the Welsh art scene change? CB: The retention of the students has been one of the main things, especially in the last couple of years or so where we've been fortunate enough through the WARP* programme to see all of these recent graduates and new emerging artists and all of the projects that they're proposing and trying to get off the ground. Last year we were awarded a Beacon grant, which the Arts Council set up with money from the Welsh Assembly. It's in recognition of excellence. G39 is one of nine visual arts organisations that have got Beacon status and I can't tell you what the most incredible impact that's had on us. It's completely radicalised the organisation. For the first time ever our staffing structure has suddenly become realistic for our output. It's not just two or three individuals struggling to do everything, it's now three individuals plus three interns and assistants plus freelancers. It's been such an eye opener into what this place can do if it has the right level of subsidy and the right level of staffing. G39 has always operated as a hub and now it's able to do that incredibly well. DT: What do you think are the main challenges facing Welsh artists today? CB: Well, I could bang on about funding because compared with England and Scotland it's quite eye-watering, but that's a perennial issue. I think there's still a real gap in criticism; there's not really the mechanism for the critical contextualising of work, it's very piecemeal. Some things do get written about and discussed but we haven't got an art journal to speak of, although whether Wales can actually sustain one is another issue. DT: It does seem that today Welsh artists enjoy a greater visibility than they once did. CB: Yes, I think visibility has really picked up. There's definitely more work to be done but I think Wales is playing it quite well at the moment. Artists like Bedwyr Williams and Sean Edwards are showing how you can sustain a critically relevant art practice on a UK stage while being based in Wales. DT: Other artist-led galleries such as Castlefield in Manchester and MOOT in Nottingham have since moved away from their humble beginnings to bigger, even purpose built, premises. Do you have similar ambitions for g39? CB: Yes, we're in this process now actually, having discussions with architects and consultants. The building we're in cureently was never intended to be our base for ten years, although it has served us really well. What we would like now is to have a bit more control, a bit more say so over what the organisation becomes, even whether it stays building-based for example. It's all up in the air and it's all up for grabs, although whatever we turn into physically, it's very important that we stick to our original remit of supporting emerging, early career artists and recent graduates. It's very unglamorous and it really doesn't do us any favours with funders but that's why g39 came about and that's where it gets it's strength and support from ‒ from this very broad community of emerging artists. I think If we can develop something that is actually useful for artists, like a proper workspace, then that would be great. There is talk of there being a new cultural development, a cultural quarter in what is currently the Port Authority area of Cardiff. There's a big plot of land there that's been earmarked for various things and I've heard that BBC Wales is meant to be getting new purpose built premises there, so g39 could be part of that but we'll have to see.